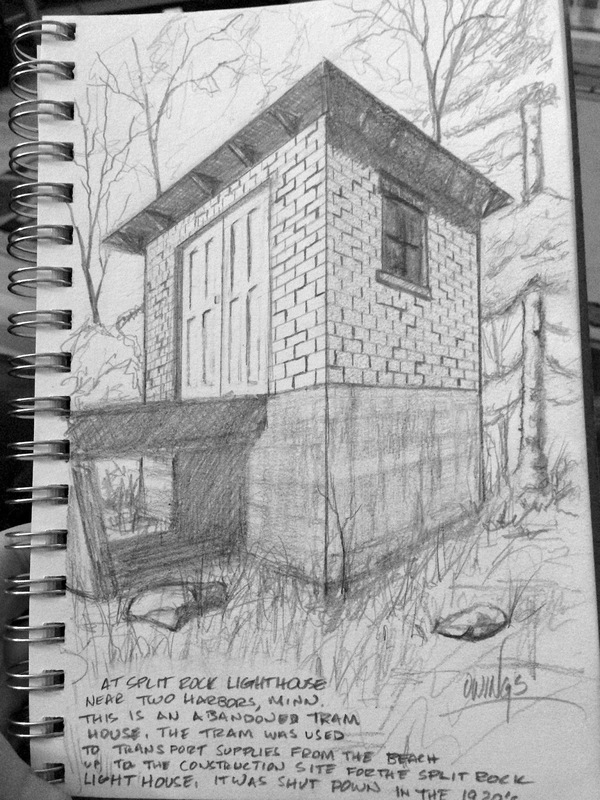 Some sketches from my trip to Duluth, Minnesota. The first two sketches are from the Split Rock Lighthouse near Two Harbors. Two Harbors is just north of Duluth and if you take the freeway a few miles further you'll run into the Split Rock Lighthouse. Built in response to several tragic ship wreck incidents which occurred in 1905, the Light house was completed in 1910 at a cost of $75,000. It remained in service until 1969 when modern GPS made the facility obsolete. The Lighthouse has been restored to its 1920's grandeur. The Lighthouse and the grounds around it are part of a State Park now and is a popular destination for people traveling to Lake Superiors North Shore. 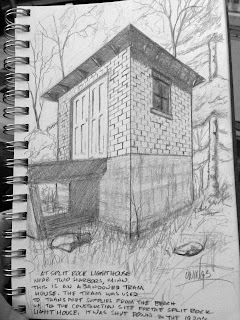 The first sketch is of the Split Rock Tram house. During the construction of the Lighthouse, ships brought supplies to the shore. The supplies were loaded up on a tram which road up the steep hillside on rails. The Tram house is about 3/4 of the way up to the Lighthouse site and still stands in good condition. The rails have all been removed, but the supports for them still remain. The second sketch is of the Lighthouse itself. Once a year on November 10th the lighthouse is lit to honor the 29 men who were lost when the ore freighter Edmund Fitzgerald sunk in rough seas on Lake Superior. The final sketch is of the Aerial Lift bridge in Duluth Harbor. A large, modern freight ship is making its way into the harbor as it passes beneath the raised lift bridge.